Sensor adapter system for call systems. 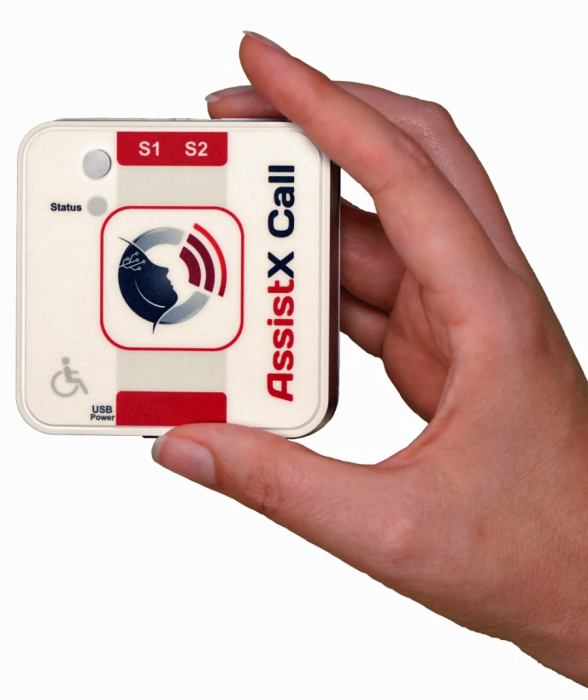 An interface for connecting 2 single push-buttons or AssistX port compatible sensors to a nurse call system. AssistX Call is equipped with 2 AssistX ports. These can be connected to any 2 single sensors or push-buttons or AssistX port compatible sensors. AssistX Call is delivered to fit the corresponding call system. The power supply, if supported, is provided by the connected call system. If this is not possible, the power supply is provided by an external power supply, protected by a backup battery with several hours of runtime. AssistX Call is a sensor adapter for luminous call systems and enables call triggering using special sensors (call triggers) which cannot be connected directly to the call system. For example, with AssistX Call the proximity sensor AssistX ProX, acoustic sensor AS one, sip-puff encoder Pneumax, infrared receiver AssistX IR one, or various push-buttons, including large-sized push-buttons, can be used to call for help. AssistX Call is powered by the call system or an external power supply. In both cases, the device works even in the event of a power failure in the network. When powered by an external power supply, the built-in lithiumpolymer battery ensures full functionality for a few hours in case of power failure. The device is individually configured for different call systems and delivered with a connection cable pre-configured to the call system. Inputs for call triggering The sensors are connected to the two 3.5 mm input jack plugs. AssistX Call can add and distinguish between different sensors. The AssistX Call monitors safety-relevant parameters. If a proper function is no longer guaranteed, the device triggers a call. A defective sensor / switch cable or an inadvertently unplugged sensor / switch can present a danger to the caller or third persons. If a sensor error is detected, a call is triggered. The error can be displayed visually and acoustically. A defective cable can only be detected with sensors with a normally closed contact. (For example, with the proximity sensor AssistX ProX, the acoustic sensor AssistX AS one, Hy-Pneumax or the PikoButton NC). For simple switches with a normally open contact, it is not possible to detect a defective cable for technical reasons. In order to achieve the highest possible degree of safety in these types of switches as well, simple switches with normally open contact must be operated at least once every 24 hours. As a rule, this is guaranteed in everyday nursing care. If the 24 hours are exceeded without the sensor being activated, a signal light on the AssistX Call flashes and signals that the sensor is no longer considered safe and must be activated. If activation is detected, the LED goes out again. The call is triggered in parallel. However, a sensor / switch test can also be manually requested at any time by the nursing staff (morning routine). Power supply: Power supply via call system 6.5 - 36 VDC Ext.